Definition: The Rush-Bagot Treaty, or "Rush-Bagot Disarmament", was an agreement between the United States and Great Britain to substantially reduce their naval vessels to patrol boats at the Great Lakes and Lake Champlain following the end of the War of 1812. The Rush-Bagot Treaty was ratified by the United States Senate on April 16, 1818. The Agreement was signed by Richard Rush, Acting Secretary of State of the United States, and Sir Charles Bagot, the British minister in Washington DC. 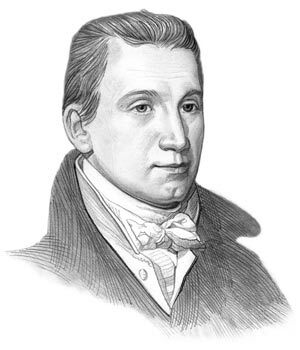 James Monroe was the 5th American President who served in office from March 4, 1817 to March 4, 1825. One of the important events during his presidency was the Rush-Bagot Agreement of 1817 that demilitarized the Great Lakes. The War of 1812 between the US and Great Britain had abruptly concluded with the Treaty of Ghent. The War of 1812 had been fought for the conquest of Canada. Both the British and the Americans were constructing massive battleships for Lake Ontario at the time the treaty was signed. The War of 1812 had ended in a stalemate. Both sides wanted peace, the war had been extremely expensive and both sides were looking for ways to save money. The Rush-Bagot Treaty was extremely unusual as it was based on an exchange of notes (letters) between Richard Rush and Sir Charles Bagot. The terms were suggested to Richard Rush by President Monroe in a letter dated August 2, 1816. The method for obtaining the understanding between the US and British governments was the diplomatic device known as 'an interchange of notes'. A series of notes passed between Rush and Bagot and they reached agreement. In 1818 the U.S. Senate gave its approval of the notes, giving them the authority of a treaty. The simple exchange of notes between the two diplomats therefore became the Treaty of Rush-Bagot. What were the aims of the Rush-Bagot Agreement? What were the Terms of the Rush-Bagot Agreement? ● On Lake Ontario one Vessel not exceeding 100 Tons and armed with one 18 pound cannon. The info about Rush-Bagot Agreement provides interesting facts and important information about this important event that occured during the presidency of the 5th President of the United States of America. The article on the Rush-Bagot Agreement provides an overview of one of the Important events in his presidential term in office. The following James Monroe video will give you additional important facts and dates about the political events experienced by the 5th American President whose presidency spanned from March 4, 1817 to March 4, 1825.